"Lesbian Nazi Hookers Abducted by UFOs and Forced Into Weight Loss Programs... all next week on Town Talk." Everyone is a fan of something or someone. If you were to ask me who I was a fan of, I would have many answers. I could easily give names such as Danny DeVito, Dwayne Johnson, Taylor Swift, Doug Walker, and many other people with various levels of fame. 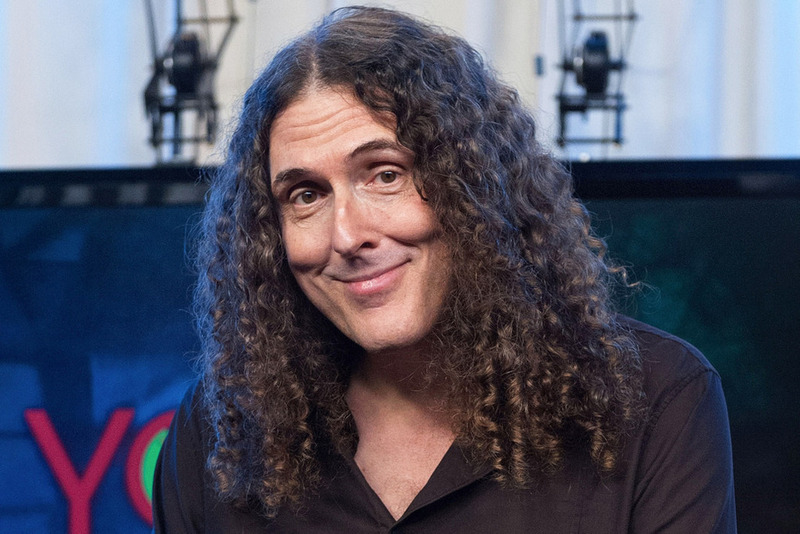 However, if you were to ask me to only pick one celebrity who rises above the rest and has influenced my life in some way, that man would be "Weird Al" Yankovic. The year was 1999. 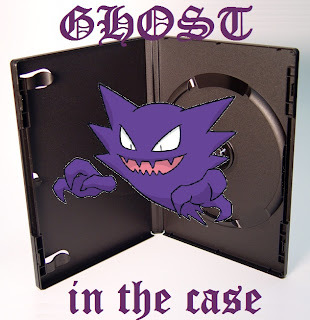 A 12 year-old Ghost had only taken baby steps into music. Sure, I played the piano but as far as listening to popular and new music I just didn't really care up until that point. It was that same year that Star Wars Episode 1 came out in theaters and I was in full-on Star Wars mania. As it so happened, I was lounging around my cousin's house watching VH1 when a music video of some guy looking like Obi-Wan Kenobi from the newest movie came on. It was catchy and pretty funny so I made sure to write down the name of the artist and look him up on my dad's dial-up computer that evening or weekend. I found the song in question was featured on Weird Al latest "Running with Scissors" album. I decided to use my allowance to purchase said album and have been hooked on Al ever since. His comedy has pushed me to be a funnier person in general. His parodies and polka medleys lead me towards listening to many other musicians. You can quite easily make new friends once you find out they are a Weird Al fan. It's similar to finding another Brown Coat or Whovian, once you realize they are a Weird Al fan you don't need to know much more to be their friend. Lasty, his music has allowed me to "entertain" people even to this day with karaoke and lip sync battles of his songs. But enough about how much I love Weird Al. You're here for the movie review right? 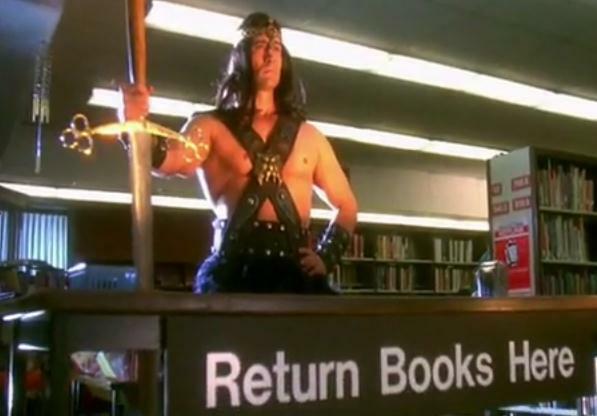 When most people think about Weird Al they generally only think about his songs and music videos. What people may forget (or not even realize) is that Weird Al has done a great deal more than just his amazing music. Al has been busy writing children's books, voice acting, directing music videos for other artists, and he even created a tv show and movie. 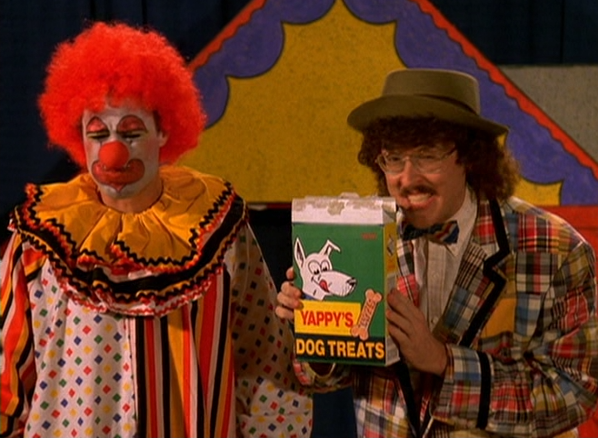 The movie, UHF, is the focus of today's review. In 1985, somewhere around the release of Al's second album, his producer believed that Al's type of parody could translate well into a movie similar to the likes of Leslie Nielsen's "Airplane!" The pair spent the next couple of years bouncing the idea around different studios until Orion finally picked it up. 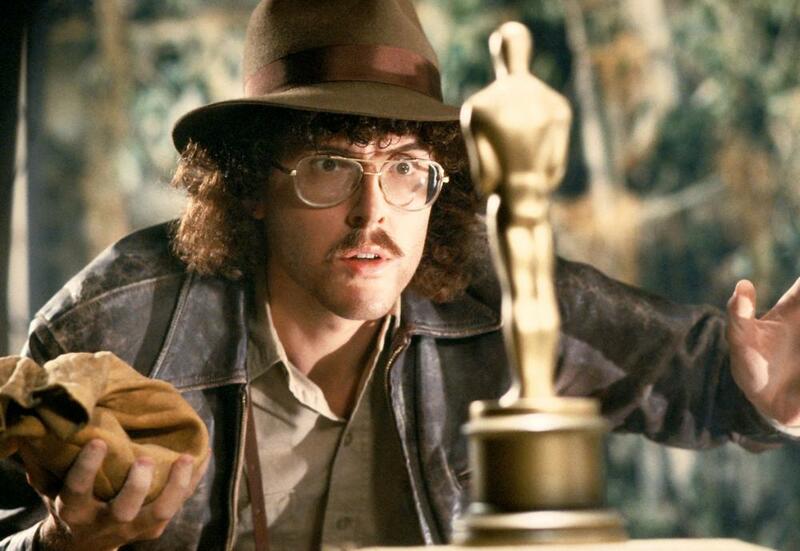 In 1989 UHF was finally released to the public. 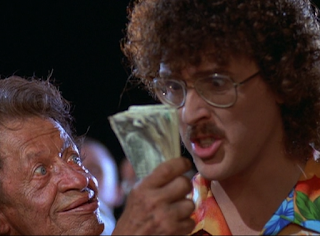 Did Weird Al's venture into the film industry make us all laugh or was it just another "Polka Party"? Let's take a look. George Newman is a constant daydreamer. His dreaming always seems to get him and his friend Bob fired from every job they have, including their latest job flipping burgers. When George's Uncle Harvey wins the deed to a local run-down UHF station in a poker game, George's aunt convinces her husband to allow George to work there as the manager of Channel 62. George takes the job eagerly and brings his girlfriend to see the place, meeting a beggar along the way for a rather amusing joke (the beggar will be important later.) George meets his staff who are, in all honesty, a group of misfits like himself including a secretary who wants to be a newscaster, a "little person" camera man, another silent camera man, and the bizarre engineer named Philo. George attempts to meet the competition, and he introduces himself to R J Fletcher of Channel 8, the town's network station. R J, a very hateful and detestable man, kicks George out. On his way out, George meets up with Stanley Spadowski, Channel 8's recently fired janitor, and hires him on to be the Janitor of Channel 62. George begins to use his imagination to create brand new programs for the station, but despite his efforts the programs are still poor and the station is floundering. By looking over the books, Bob realizes that the station will go under in less than a week. Bob and George burn the midnight oil trying to find ways to keep the station afloat, which causes George to accidentally miss his girlfriend's birthday dinner. She dumps him as this was the last straw in his never-ending stream of shenanigans. The next day, George, being fed up, begins shouting on the live children's program and walks out mid-program on his way to the local bar. George tells Stanley that he can take over the show if he wants. In a bizarre twist, Stanley's weird antics become a smash hit and begin to generate some ratings and revenue for the station. 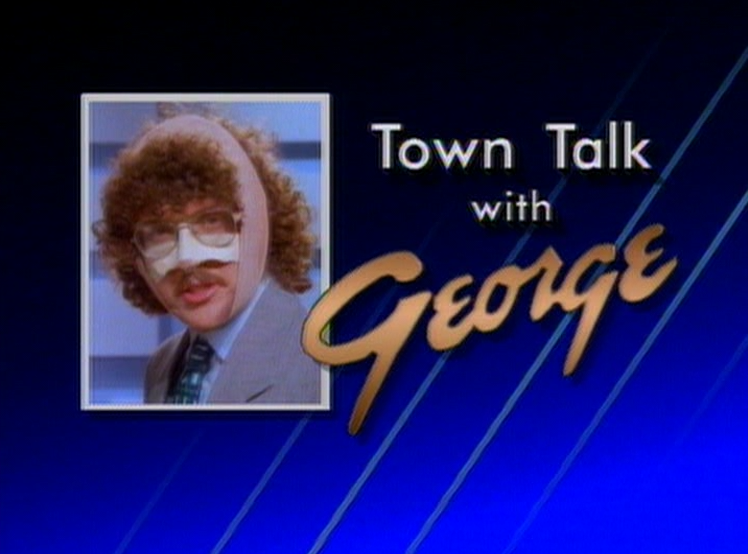 George comes up with a few similarly bizarre shows to air and together with Stanley Spadowski's Clubhouse begin to generate ratings that compete with, and even out-do the network stations. Unfortunately, Uncle Harvey's gambling habit has caught up with him in a big way as he finds himself suddenly $75,000 in the hole with only two days to pay his bookie. R J Fletcher, eager to rid himself of Channel 62's interference in his ratings, agrees to pay Harvey the required money in exchange for ownership of Channel 62. George's aunt learns of this debacle and Harvey agrees to allow George to find a way to come up with the money in those two days before he accepts RJ's offer. 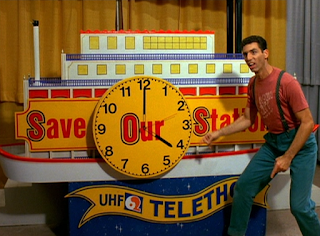 The station then puts on a telethon lead by Stanley, to sell shares of stock in the station to help raise the money. Meanwhile Philo bugs R J Fletcher's office for fear of R J trying to stop George's efforts. The telethon is going great but it screeches to a halt when Stanley is kidnapped by a bunch of thugs from Channel 8. As George and a small group of martial artists infiltrate Channel 8 to rescue Stanley, R J Fletcher begins broadcasting an editorial to slam Channel 62. Philo interrupts the broadcast and instead plays footage he had recorded of R J insulting the entire town. With Stanley back at the studio, sales of stock begin to rise but the station is $2,000 short. Harvey agrees to R J's terms but before the papers can be signed, the beggar from before shows up with $2,000 he has gotten from selling a single rare penny that R J had unknowingly given the beggar to get him to go away. George hands over the $75K to Harvey's bookie and the station is saved as well as George's relationship with his girlfriend. Let's be perfectly honest here. You didn't come here for that plot mentioned above. Nobody came to this movie for that plot. What you came here for is Weird Al being crazy and doing his parodies and satire. Thank goodness there is a fair amount of that in this film. I didn't focus on that aspect in the plot segment as it generally had little to do with the plot. When I said that George was a daydreamer, I failed to mention that you actually get to see these daydreams (and one actual dream) play out in the film. 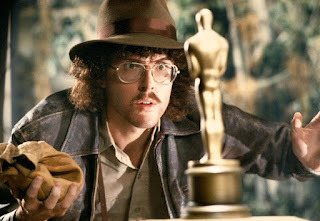 In fact, the film opens with a gigantic spoof of the beginning to Raiders of the Lost Ark in which Al goes through all of this trouble to get the golden Oscar off the pedestal and eventually be squashed by the rolling stone. Later we see him falling asleep while the Beverly Hillbillies is playing resulting in the music video for his song "Beverly Hillbillies/Money for Nothing." 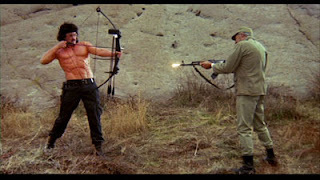 When George goes to rescue Stanley from Channel 8 he fantasizes that he is Rambo going through a group of men and destroying everything in his path while remaining unscathed. Lastly at the very end of the film he fantasizes being with his girlfriend in a sort of Gone with the Wind style spoof (or at least that's what I think he was parodying.) The majority of these are done with the general humor and wit that Weird Al's songs of that era tended to have. There are still a few of the odd jokes here and there that made me laugh far more than they probably should like George making a mountain of mashed potatoes, dumping a terrier in a punch bowl absentmindedly, and eating the dog treats by mistake. One of the single funniest random moments outside of dreams and television was when George first met the beggar. The beggar asks for change so George reaches into his pocket and holds out his hand for the beggar. The beggar counts up to $1 then places a $1 bill in his hand and walks off. 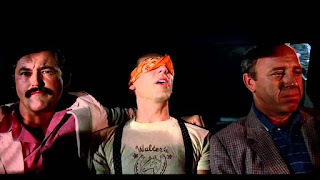 While there are some good moments like that in the regular plot, most of the comedic gold comes from the exact reason this movie was made to begin with. Weird Al being crazy and funny with his satire of TV shows and Movies all through the filter of late 80's cheese! I kind of touched on this in the "good" section but, when the film isn't showing dream sequences, commercials or the later TV shows, it's mediocre to the point of forgettable. This plot is not that original and it truly shows that they placed it in there as a vehicle to usher you from one funny spoof to the next. While I understand that you do need that vehicle unless you're truly doing a compilation of short films, the vehicle they have chosen to do this job is an old clunker you see barely doing 30 MPH down the highway There's nothing spectacular or even that special about the true plot of the film. The humor is extremely hit or miss when it's not attempting to satire, with miss being the more prominent of the two. There's honestly no in-between on the comedy. I found myself either legitimately laughing out loud, or just staring blankly at the screen. While I hate putting this on the "bad" list, the more I think about it, the more it needs to be addressed. I enjoy Michael Richard's acting. I generally think that he is a very funny man and can do some great work. It's too bad that the more I watch of his Stanly Spadowski character the more I find him really obnoxious. I know he's supposed to be a simple man. I know he may very well be portraying a character with some mild form of special needs. While there are some moments in which I find him endearing like when he's talking about life being like a mop or entertaining the children, there are more moments where he's just being flat out obnoxious. Practically every moment he's on screen while he's being held by the thugs was overkill on the annoyance. I'm sure is supposed to be funny, and maybe the point of the scene was to sympathize with the thugs a bit, but he was getting on my nerves just as much as he was getting on theirs. I don't know, I just found that the longer the film went on I wanted more of anyone else but him. My last point may or may not be a bad thing for you depending on your tolerance. This film was released in 1989 and as such has some slightly dated comedy that's just dripping with 80's cheese. While I tend to find this dated humor charming I can easily see how a more modern audience might not quite grasp or even enjoy some of these references or very on-the-nose jokes. If you like other 80's spoof movies such as Airplane! and The Naked Gun then you probably won't have a problem here. If you have never seen these films either, then tread lightly as what you find may not be to your liking. Obviously, I love Weird Al. 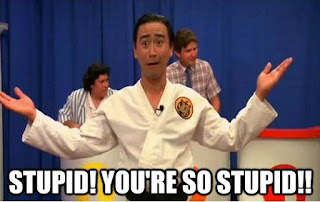 I love his type of comedy whether it be in his music or any other avenue. As I am such a fan, I can honestly say that I enjoy this film. However, even my love of Al can't hide the extremely mediocre plot that's woven in between Al's awesome spoofs. I also can't ignore the fact that some of the jokes fall flat on their face. It's a sort of mixed bag of equal parts excellent, cheesy, forgettable, and bad. 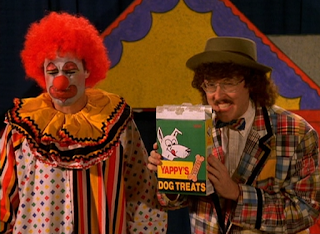 This film is for fans of Weird Al Yankovic and lovers of late 80's comedic nonsense. If you aren't fans of either then there's literally nothing here for you and I would suggest you skip this one. However if you are a fan of either Al or late 80's comedies then this might be an interesting little diversion for you. It was created solely for the purpose of Al getting to set his particular brand of parody out there on the big screen. If this sounds like something that might interest you then you'll probably be fairly entertained. It's not a masterpiece but it's still a good watch for any and all of us close personal friends of Al! 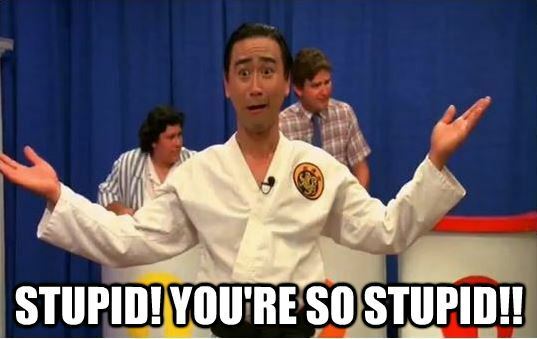 UHF is rated PG-13 and is available on DVD from Orion Pictures.